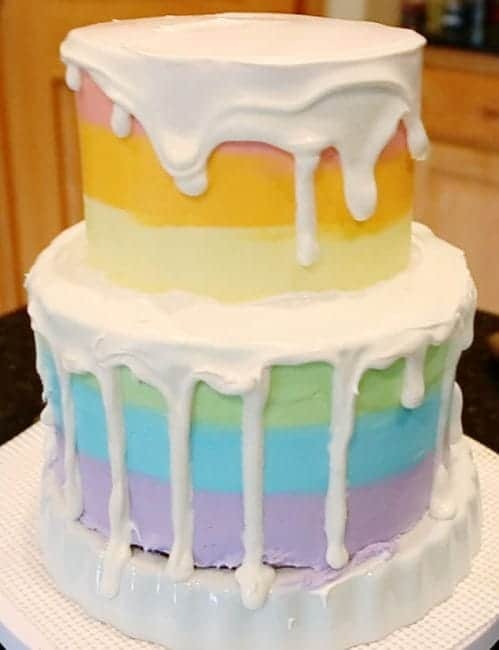 This cake was a horrible, happy accident. I love the final product, but getting there was no easy task! 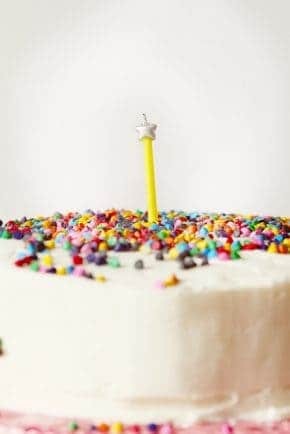 white cake recipe – I doubled the recipe (3 layers for the bottom of this cake, I saved and froze the 4th layer) with 8-inch round cake pans, then 1 additional white cake recipe in two 6-inch round cake pans. Begin by baking the cakes. I baked three TOTAL white cake recipes. First, I doubled the white cake recipe and baked 4 layers of white cake. (I only used 3 for my cake, so the fourth layer was wrapped and frozen for later use.) I then whipped up another white cake recipe and baked it in two 6-inch round cake pans. 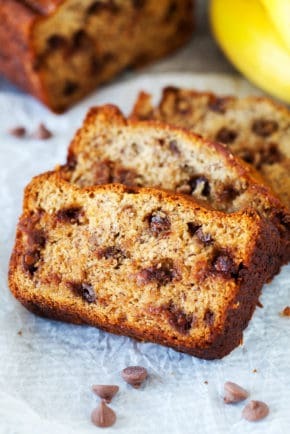 When cakes are done baking and cooled, level them. Begin by placing first 8-inch round layer of cake on cardboard round and place that directly on top of rotating cake stand. Cover with 1/2 cup to 1 cup of chocolate buttercream. Smooth out with a small offset spatula. Place next 8-inch round layer on top and add chocolate buttercream. Finish with final layer of white cake. (Cake should be 3 layers) Cover the sides of the cake with chocolate buttercream. Chill in freezer while assembling the next tier of the cake. Place 6-inch cardboard round on the rotating cake stand. Set one 6-inch round layer of white cake on the cardboard. Cover with 1/2 cup of chocolate buttercream. Place the final 6-inch layer of cake on top and fill in the sides with chocolate buttercream. Move this 2-layer cake to freezer. Prepare white buttercream. Separate buttercream into 7 bowls. (You need to save about 2 cups to cover the top and sides of both tiers of cake in a crumb coat.) Divide the remaining frosting between 6 bowls. You should have about 1 1/2 cups per bowl. Tint pink, orange, yellow, green, blue, and purple. 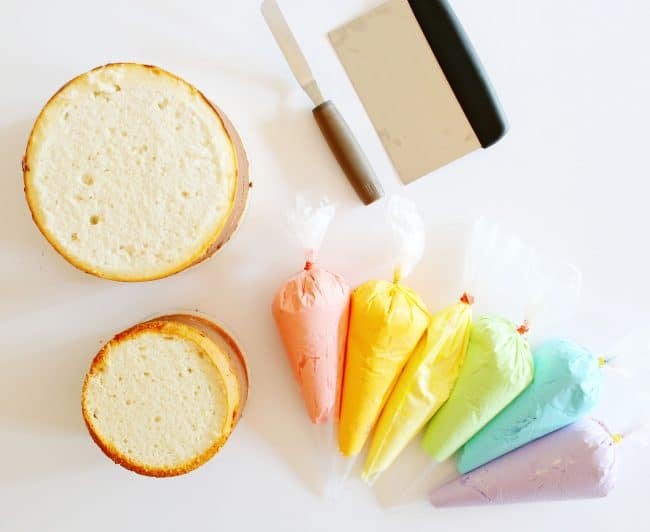 Once you have tinted all of the frosting, place each color in a pastry bag and seal with a rubber band. Tint pink, orange, yellow, green, blue, and purple. 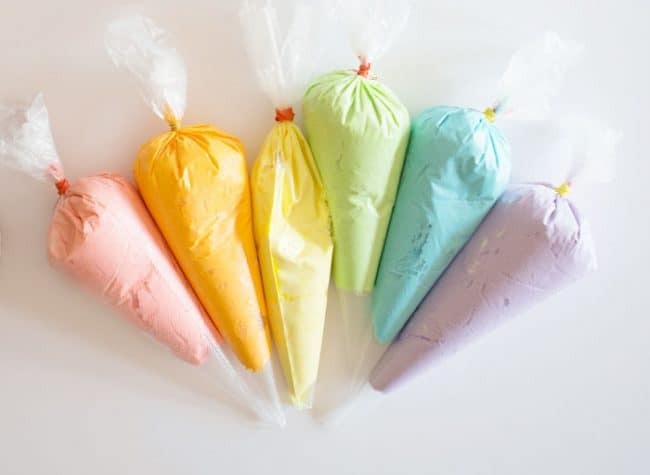 Once you have tinted all of the frosting, place each color in a pastry bag and seal with a rubber band. 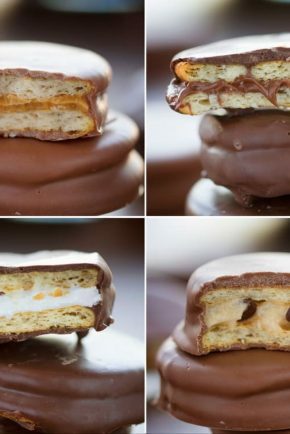 Remove your 3-layer cake that is on the cake stand from the freezer. Cover the cake in a thin layer of white buttercream, this is your crumb coat. Repeat this process with the blue frosting. Then repeat that with the green frosting. Make sure just a bit of your green frosting overlaps on top of the cake. Now take the bench scraper and hold it flat against the side of the cake. Holding your hand steady, start to move the cake stand around, trying not to stop. 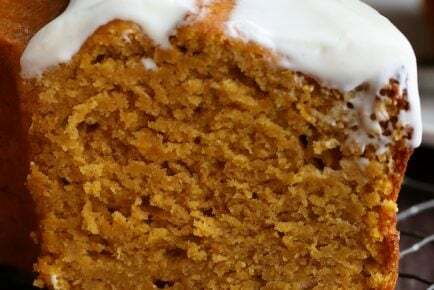 Go around as many times as you need to create a smooth finish on your cake. Now! Back to this cake. Set the 6-inch cake stack on top. Repeat the method you used above, only this time, start with yellow. Then orange. Then red. Smooth out the top. Fill pasty bag that has been fitted with a #362 tip with buttercream. (any large open star tip will work) Start piping out a shell pattern around the base of each cake. Then finish with that same shall border pattern around the upper edge. 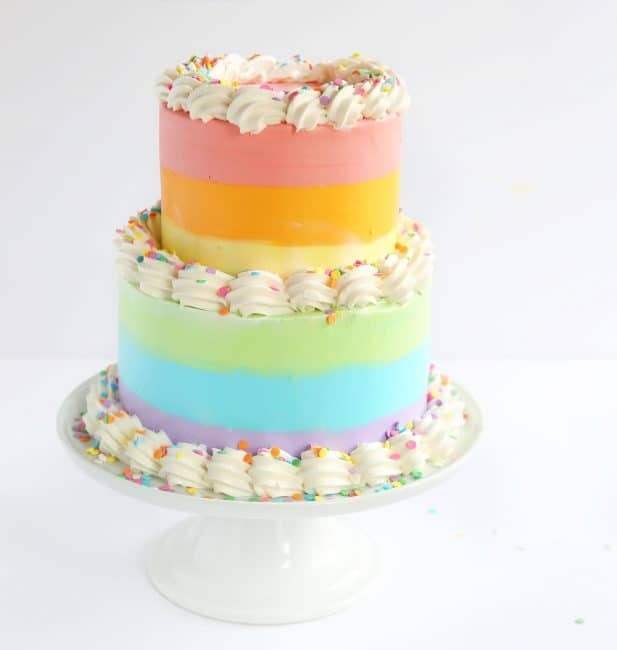 Cover the piping with pastel sprinkles and chill until ready to serve! So! If you saw that video you saw how HORRIBLY I messed up this cake. It was UGLY. I mean. I don’t even know. Literally, have no excuse. You recovered nicely! Final cake is beautiful as always Amanda! I would have eaten it before and after anyway!! I love the final product and it is way more than “not hideous”. 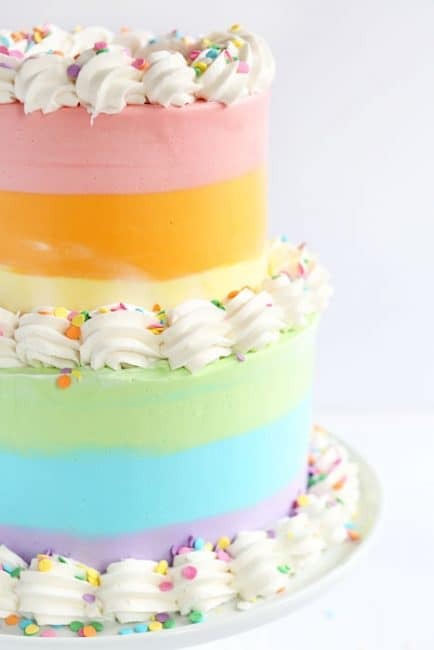 I love what you have done with this cake…Please advise me on how I can make a frosting less sweeter. Great cake! Do you use 2″ or 3″ deep cake pans for your cakes? 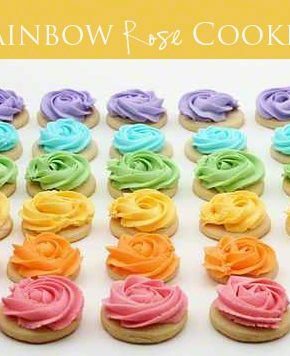 Can i freeze unused buttercream icing to use At a later date? And how far in advance can i make cupcakes? I just love your website, I am Baker. 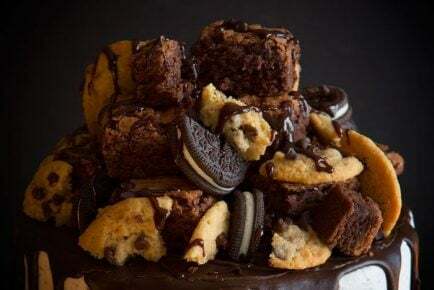 I follow you daily and bake something once a day and share your recipes with friends. can you recommend a chocolate cake recipe I could use instead of white cake?